Welcome back to another weekly podcast of The Rebel Beat! It was a huge honour to welcome the legendary UK DJ Don Letts as our special guest on the show this week! 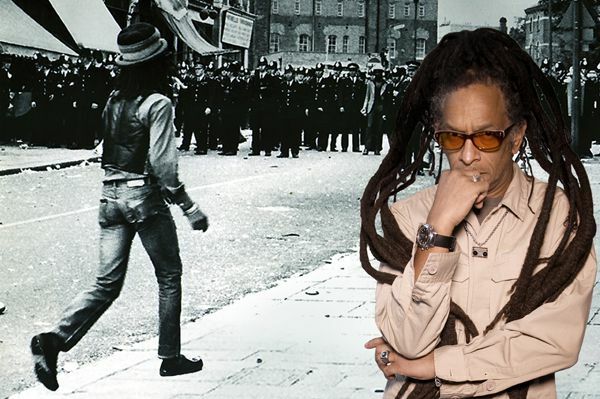 It is no exaggeration to say that punk rock would not be the same today were it not for Don Letts. As a staple on the early London punk rock scene, Don was best known as the DJ at the infamous club The Roxy. As a Londoner of Jamaican descent, Don famously brought reggae to the punks, hence starting a movement which bridged continents, genres, and brought together working class youth across racial lines. As a young man during the tumultuous 70s in the UK, Don was also no stranger to radical street movements against police brutality and racism. It was this photo that was captured of him at the 1976 Notting Hill Carnival Riot that graced the album cover for The Clash’s “Black Market Clash”. We were thrilled to talk with Don about the scene surrounding this iconic album cover, his comparisons between the riots of England in the 1970s, and present-day riots against police brutality in the USA, cultural appropriation in the punk scene, and the future of political music. Hope you enjoy this podcast! We’ll be back July 1st for a special anti-colonial anti-Canada mix! Amiri Baraka – Who will survive America?